Get the flavors of a cheeseburger but in a savory and comforting soup form. 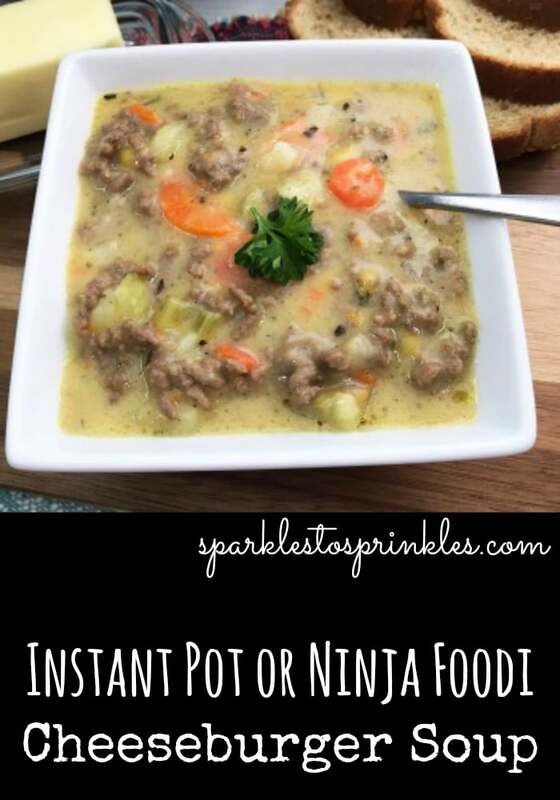 This Instant Pot or Ninja Foodi Cheeseburger Soup, is a total comfort dish. Ground beef, potatoes, carrots, cheese in a creamy base. Dive that spoon in and taste one outstanding soup that is crowd worthy. This Instant Pot Cheeseburger Soup is the perfect hearty soup for any day. Perfect for snow days, perfect for weeknights, pairs perfectly with a salad to make a complete meal. Great for picky eaters, they can’t resist the cheeseburger soup! 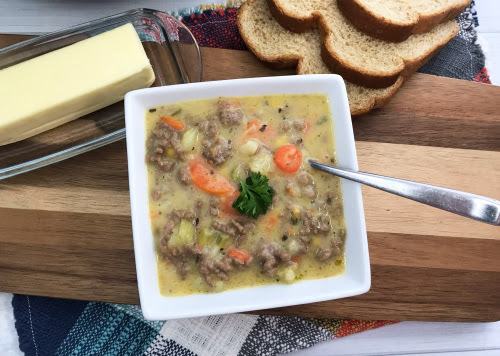 What I love about the cheeseburger soup is it can be used in your Instant Pot or Ninja Foodi. The Ninja Foodi is an Air Fryer and Instant Pot in one essentially. It has interchangeable lids, so you can really maximize the versatility. This recipe right here can be made in either, using the Instant Pot feature on your Ninja Foodi device. You can store this in the fridge for 3-4 days. Just store with a lid over the top so it is secure. Then heat the soup up as you go for that quick lunch or supper. You can freeze cheeseburger soup, but one note is the potatoes will change in texture slightly once they get frozen. They will become a bit mushier in texture. Now, the flavor of the soup will remain, it will just have a slight texture change. If you do freeze the soup place in a freezer bag and remove as much air as you can, or place in a container that is airtight. Then freeze for 1-2 months. Thaw and reheat on the stove when ready to serve. If you find your soup got pretty thick sitting in the fridge or freezer, then add a little chicken stock or even milk to the soup and give it a good stir as you warm it up. This will help lessen the thickness. Do a little at a time to get the consistency you want. So if you are wanting to use ground turkey or chicken to replace the ground beef you are welcome to. It will adjust the flavor. As the ground beef is meant to give you that classic cheeseburger taste. If you need to add a tiny splash of oil to add some grease into the pot if your meat is seeming to stick. Want to add some toppings to this soup. You are in luck here are some of my families favorite toppers for cheeseburger soup. As you can see this recipe is dynamite. Make it this week and see how you and your family enjoy the rich and creamy Ninja Foodi cheeseburger soup recipe! For another hearty instant pot soup recipe, try my Instant Pot Split Pea and Ham Soup. You will love it! Place the ground beef, garlic and diced onion in the instant pot and turn on the saute function. Cook the meat through and drain off the grease. Add the cubed potatoes, carrots and celery. Add the salt, pepper, parsley, basil and garlic powder. Pour the chicken broth over the top and give the mixture a stir. Press manual and set the timer to 5 minutes on high pressure making sure the valve is sealed shut. Once the instant is done cooking carefully vent. Carefully remove the lid after venting and stir in the (2) cans of cheese soup and the half & half stirring to combine. Replace the lid and let the mixture continue to warm through. You can also keep the lid off and turn the saute function back on and let the soup and cheese mixture heat through.